The Community Trust is really excited to announce a new and very different project in conjunction with Ian Middleton. Ian is a well-established professional artist who lives in our village. 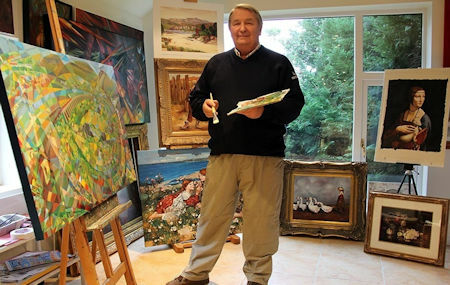 Much of his work can be seen at The Somerville Gallery in Otley and on his website: https://www.somervillearts.com/ and as can be seen he has painted in a very wide range of styles. He is assisted by Rhiannon Forbes-Wake. ​In a discussion with Duncan Ault, chair of the Burley Community Trust, Ian offered to do a painting of Burley in Wharfedale, done in the style of his very well-known earlier painting Yorkshire (below). This is semi-abstract with a geometric composition; our village will look wonderful! Duncan first discussed the commission with Ian over a year ago and plenty of research and planning has since gone into it. ​The finished work will be donated to the Community Trust. The Trust is working with Ian to ensure that everyone in the village will have access to a low cost print of the painting, in addition to a limited edition version for those wanting something more substantial. We have lots of ideas on how to promote all of this and want to involve people in the village as much as possible. This will be a great opportunity to see the painting take shape. Ian will be drawing and painting live in the library now and again, with two initial dates planned for the afternoons of Thursdays 5th and 12th July. We hope that classes from the local schools will come in and have a look, and perhaps be inspired to undertake some art work of their own. It’s hoped that the finished work will be available for view in time for the Christmas lights switch-on, Saturday 1st December 2018. ​Lots of thinking has already been done on what special village locations should be included so we’ll be sharing the list in the library. Ian will be meeting the history group shortly and looking at their archive collection. Which views do you think should be included, from now and in the past?